The Rob|Arch 2012 Rotterdam, takes place at Hyperbody’s robotics lab at the RDM Innovation dock in Rotterdam. The workshop is co-taught by Jelle Feringa  and Wes Mcgee  and will run simultaneously with other Rob|Arch workshops that take place from the 14th to 16th of December. This effort is part of the International conference on Architectural Robotics, an initiative of the Association for Robots in Architecture. The workshop explores material processes that support an architecture of volume. The workshop focus is specifically on modes of production that do scale to architectural proportion, and Investigates processes that aren’t constrained by the limitations of sheet based materials. By Robotic Hot Wire Cutting, a vaulting structure will be erected, by casting concrete from EPS molds. A third robotic cell is cutting stone using a hydraulic powered diamond wire saw, exploring the potential of robotic masonry. 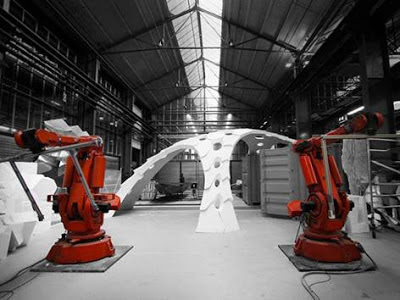 The workshop will provide participants with a unique chance to explore large scale robotic fabrication and will provide useful insights on the production process of robotic fabrication. While non-standard design has traditionally been associated with costly manufacturing methods, robotic hotwire cutting (RHWC) breaks with this trend given that complex formwork can be delivered for the approximate cost of normative formwork. As such RHWC is both an enabler, technically, in terms of forms that can be produced, and economically since this can be achieved at little or no additional expense. With the many ongoing predicaments in the construction industry, and the modest cost of delving into robotics, this is an important aspect that is open to further exploration. Robotic fabrication presents a development platform for such considerations, given the trade-off of precision, ease of integration and programming, robustness, and market availability. As the technology has begun to gain acceptance in the building fabrication industry (admittedly it remains a very small fraction), these methods have started to challenge what type of construction can be delivered within a given budget. For more info or to sign up, please visit the Rob|Arch2012 web site. For a video impression of earlier workshop held at Hyperbody’s robot lab, please see this link.